Delhi, India – Grigory Avetov, Rector of Synergy Business School, Moscow, and journalist Dmitry Portnyagin came to talk to His Holiness the Dalai Lama this morning. They recorded an interview that took place in English but was simultaneously translated into Russian. Introducing himself, Dmitry Portnyagin told His Holiness how pleased he was to meet him in person. He said he had been familiar with his face since he was a boy because his grandfather cherished a photograph he had of His Holiness. He opened the conversation by asking His Holiness what advice he could give about balancing material goals with spiritual values. “Is today’s world happy or not?” His Holiness asked in reply. “There’s still a lot of violence in the world. Even in those places that are peaceful, there is a growing gap between rich and poor. “Many of the problems we face are of our own making, which reveals a contradiction. Of the 7 billion people alive today, none wants to face problems, and yet we make problems for ourselves. Why does this happen? It’s not our deliberate intention. Experience and common sense tell us that if we have peace of mind, we feel better in mind and body. And yet the trend of our existing education systems is to aim for material goals. Those who have been brought up in this way aspire for material success with little appreciation that inner peace is something that comes about in the mind. Nevertheless, material development alone will not make humanity happy. “If our basic human nature were anger, there’d be no hope, but because it is largely compassionate there is hope. Being concerned with the welfare of others is the basis of our survival. The reality is we need and are dependent on each other, so the time has come to work together. We need to take the oneness of humanity into account. 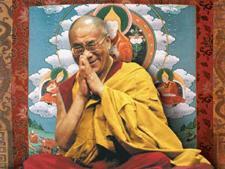 Asked if we can imagine that the world will become more peaceful, His Holiness replied that of course it was possible. He recalled the spirit of reconciliation that followed the Second World War. He reiterated his admiration for the spirit of the European Union—describing the conscious effort to overcome past enmity to work together in co-operation as an exemplary sign of maturity. “Russia is a great nation and the Russians are cultured people. It’ll be good if a spirit of responsibility and a wish to be of help prevails instead of the use of force and the fear it entails. Not only is that approach out of date, but fear and trust don’t work together. “Russia has great potential and if it is employed with compassion and a sense of the oneness of humanity, she’ll be able to contribute to making this a century of dialogue, rather than another era of violence. He dismissed the suggestion that the use of force may be a mode of self-defence as ‘old thinking’, emphasising that the best defence was to maintain friendly relations with others. He reaffirmed his belief in the power of friendship and an appreciation the rights of all human beings. Grigory Avetov mentioned that he and his friends would like to invite His Holiness to attend the Synergy Global Forum in person, although previous attempts have failed. He asked if it might be possible in the future. His Holiness laughed and told him that while countries have to seek China’s permission about who they invite, and while hardliners brand him a splittist, a terrorist and even a demon, it doesn’t seem very likely. He regretted this, not least because within Russia, there are people in the Republics of Kalmykia, Buryatia and Tuva who follow the Nalanda Tradition as Tibetans do. Avetov, Portnyagin and their friends offered His Holiness several gifts including a Russian soldier’s hat—like one worn by Portnyagin’s grandfather, an old sand-timer, a book of Russian icons and a digitised edition of the Kangyur—the result of 30 years’ work.